Rapid and consistent analysis of mud properties during the drilling and completion of oil and gas wells is provided by the latest hand-held technology from Salunda Limited. Offering a faster alternative to conventional retort and titration testing, the battery powered MudChecker drilling mud analyser is the first electronic diagnostic device of its type for the fast, simple and accurate measurement of the oil, water, solid and salt content of drilling fluids. Drilling fluid systems are designed to fulfil critical functions during drilling. Regular analysis of fluid composition is a pivotal task for drilling contractors during exploration. Incorporating patented, sensitive radio-frequency technology, MudChecker is a compact, rugged and solid-state tester that can be quickly deployed on a drill site to provide accurate and consistent data about the mud properties that are critical to fast, safe drilling. 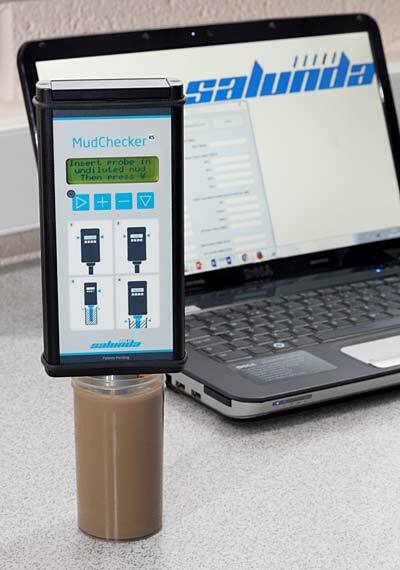 MudChecker features an integral sensor probe that is used to test a sample to provide an accurate, real time in-field measurement of mud fluid content quicker than alternative testing procedures. Consistent and repeatable results are quickly displayed on an integral LCD screen to indicate percentage oil, solid and water volumes. It also records the oil/water ratio (OWR), oil/brine ratio (OBR) and water-phase salinity. Control of these parameters can be critical for kick detection, as well avoiding wellbore collapse, resulting in equipment loss or damage, and non-productive time (NPT). The captured data can be quickly up-loaded via a USB interface to a supporting software programme and can be exported for formal record keeping and reporting. The whole process avoids the need to wait several hours to complete a retort and titration mud check, saving time in the process, facilitating the capacity for repeated checks and boosting productivity levels. MudChecker eliminates the risk of burns, fumes and electric shock associated with retort of oil-based muds (OBM) at very high temperature. MudChecker comes in a water and solvent resistant rugged enclosure for improved onsite durability and features robust, easy-to-clean stainless steel probes. Salunda propriety software is available to log, export and print-out results quickly and accurately. The compact analysis unit is supplied as part of a lightweight portable test kit, which includes a mains adapter with interchangeable European and USA adapters, downloadable software and a selection of spare tubes, probes, syringes and proprietary sample mixtures.